Without that course, I probably would still be just thinking about my ideas without taking action, pitying myself because I couldn’t code. Thankfully, I started following Ben Tossel’s work (NewCo). He provides education, tools and a community around building side-projects. I also learned of the crazy maker guy, Mubs, who built more products than all my ideas put together. And also, Pieter Levels, who I have been following for years, who is a true inspiration and opened up my eyes to the fact that anyone can be a maker. But the road leading here wasn’t that easy. Every single time I came up with a new idea to test, I hit a roadblock. I couldn’t code. The next logical thing would have been to learn to code and build my own stuff, right? Instead, I kept procrastinating and taking the easier way, finding a passionate developer who was happy to join forces and make the project happen. I had seen this happening, so if others did this, I could do it as well! They don’t prefer working for free on a side project when they can work for someone for real money. This forced me to test my ideas in a way that didn’t involve coding at all. But this was really limiting. Even building an MVP requires some minimal coding, and I couldn’t even create a simple landing page! One day, I came up with a new idea! Again. I started thinking about how I would build that, and it turned out I could put together an MVP by simply combining a few apps I had been using for years. I was right in the flow and spent the whole weekend working on it. After spending the whole weekend building TV Premiere Alert, it was finally ready! But what’s TV Premiere Alert? Let’s start with the problem it intends to solve. I got swamped this year and didn’t have the time and energy to keep up with the premiere dates of my favorite TV shows, and trust me, I have a long list. Since I’m a TV show junkie — watching TV series instead of sleeping — this was a real problem. I hated searching for premiere dates, mainly because I found mostly clickbait or long articles with a wall of text, often without even mentioning the premiere date or even if it was mentioned, they made sure it was buried somewhere deep in the article, so there was no way you could scan it and get the premiere date fast. I thought there should be a solution that sent me reminders if a new season of my favorite TV show was starting. Surprisingly, I couldn’t find any solution that would be a good fit. There are mobile apps you can use to track your selected TV shows, but that’s a standalone app that won't be opened that often (at least not by me). I needed something that fit my current routine. I thought it would be more useful to build something on an existing platform, such as email. Everyone has an email address, and most of us regularly check our mailbox. I solved my own problem and built a tool for busy TV show lovers. I was so lucky that several months ago, I came across Unicorn Platform on Product Hunt. It’s a drag-and-drop website generator, with pre-built content elements to easily put together a site. Once you add every element you need, you can download the full HTML and CSS. I used only the free components, so I didn’t have to pay anything. I opened the files with Brackets and the fun started. I had a template with default texts that had to be customized. I cleaned up some elements and further tweaked the layout of the website. This didn’t require any deep understanding of HTML and CSS. The beginner course I took provided me the necessary knowledge to customize a pre-built template. I used Canva to create the visual elements for the website; no designer help was needed. Even my logo is a standard icon from Canva, but who cares? It took me several hours to customize the homepage, and I also created a subscribe page for embedding the form. The next step was to build a form. After wasting hours with Mailchimp’s form, I was looking for an alternative solution since Mailchimp limited the maximum number of checkboxes to 60, and there was no way I could make my app work with this limitation. After surfing on Google, I decided to give Jotform a try. Shortly after registering, my form was almost ready. 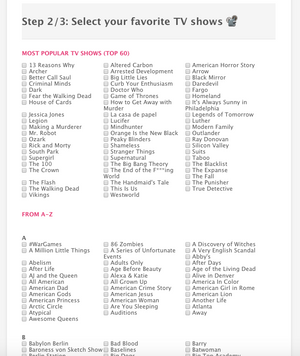 All the 500+ TV shows were added, integration was set up and it was tested with Mailchimp. Embedding the form came easy, the only tricky thing was the form’s customization. The embeddable form Jotform generates didn’t really fit in the design of my page and the whole form. Thanks to the 500+ checkboxes, it wasn’t user-friendly at all. It looks much better, but there is still room for improvement. 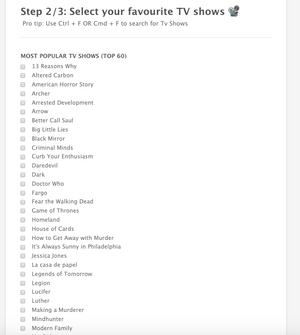 The site was ready and the “backend” worked as intended: submissions are captured by Jotform and data is sent to Mailchimp through an API so I can segment the subscribers based on what TV shows they selected. Users also automatically get an email after subscribing. I did some keyword research to optimize my domain name for terms people search for. TV Premiere Alert seemed the best option, so I took it. For buying domains, my go-to website is GoDaddy, but any similar website is just fine. The only thing that’s important is the ability to easily move your domain to other service providers. One of my colleagues recommended Netlify as a super easy tool to deploy websites. And indeed, it works like magic! After a few minutes, the site was up and running! I know it might sound a bit techy, but trust me, Netlify has some easy-to-follow guides that make it easy for anyone to deploy the website and set up hosting and an SSL certificate. Okay, subscribers were pushed from Jotfrom to Mailchimp. The next step was to set up alerts so they would receive emails on the premiere day of their selected TV shows. This process is currently done manually. I set up the campaigns one by one in Mailchimp and schedule them for the premiere days. This part of the app is far from optimal, but I’m here to test the idea, doing things that don’t scale. If the user base exceeds a certain level I can’t handle, then I will figure out a way to automate as many things as possible. Using the feedback I received and will receive, I set the next steps for the product and continue to use my newbie coding skills to improve the product and sharpen my skills as well. It might not sound like a big thing for others, but this was a huge achievement for me. I pushed myself out of my comfort zone and decided to hack together an app without coding, which helped me push myself further and build my first web app. There are many things ahead, and I’m sure if a senior developer saw my code, she would scream, but all that matters, for now, is that it works and I’m making great progress.